A non-toxic, highly concentrated vitamin solution for plants, Superthrive is recommended by both professionals and home gardeners. This amazing product is recommended for use for hydroponic systems, foliar spraying and hydro-seeding. Superthrive contains over 50 essential vitamins and hormones needed to produce an abundantly healthy and bountiful harvest. Superthrive is a superior promoter of growth as well as an exceptional plant tonic. 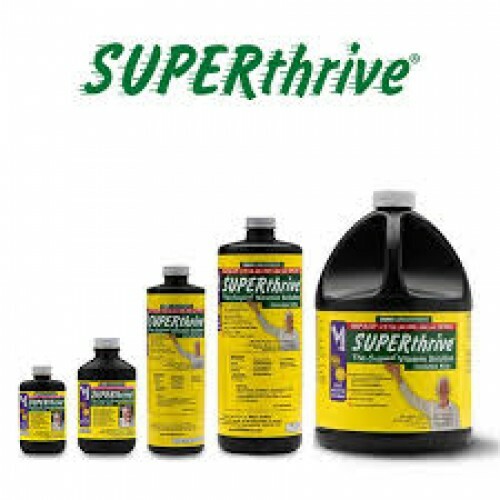 As plants require multiple levels and types of nutrients for optimal growth, Superthrive is an excellent source of essential nutrients. It naturally replenishes the soil in order to nourish the growth environment to thrive to its maximum potential so your plants will achieve maximum growth and development. As well it builds a strong root base thus reducing shock during transplant.